I wanted to share a couple of images from the project that I'm working on with artist and friend Stewart Parker focusing on the old and often handpainted signs in Odessa, Texas. We shot the whole thing on beautiful medium format film and we are currently working on processing and printing everything. We will be presenting the images in Odessa sometime this Spring and hope to be showing them in Austin somewhere as well, though we haven't figured out where just yet. 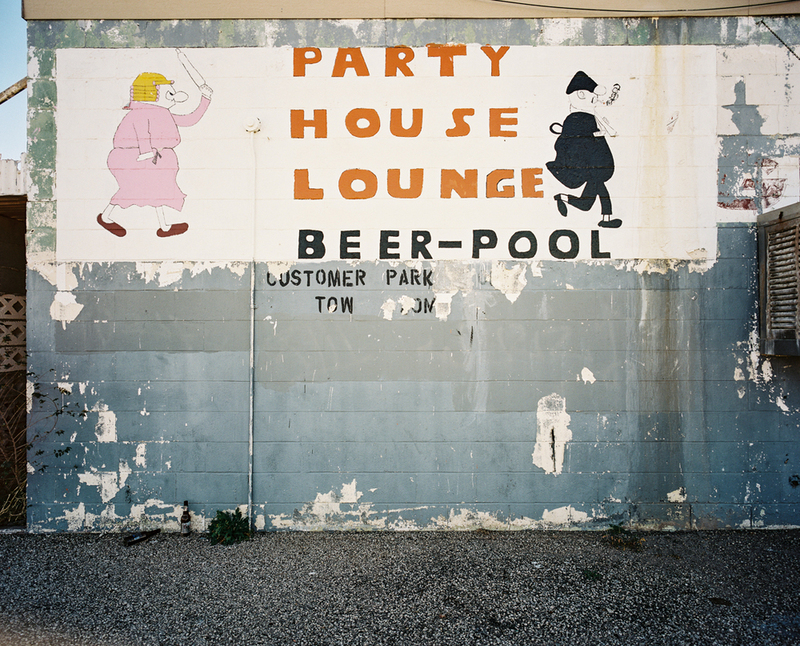 One of our favorite places was called the "Party House." After taking this picture Stewart and I decided we would drop in for a quick beer. We were served Natural Light in frosty mugs. There was only one regular in there who put Hank Williams Jr.'s "Women I've never had" on repeat on the jukebox. Stewart asked the bartender if the party was going to get going a little later on. She said with a sigh, "it's still going." The lovely Maia Assaf overwhelmed with the desire to eat all of the delicious offerings at Canter's Deli on Fairfax. In other news Maia and I have just spent the last few days in Los Angeles visiting friends and exporing. We're now on our way to Tokyo to explore some more. In fact I'm composing this on the plane to Tokyo right now. Here are a couple from Los Angeles, I hope to have some from Tokyo soon. We went to see Thad and Miram, who are silhouetted in this picture, in Topanga. They took us out to see Tuna Canyon which was incredibly beautiful and presented wonderful opportunities for black and white landscapes. Miriam is one of Maia's Mom and Dad's best friends, in fact she introduced her parents. Maia's parents were married over 25 years ago on their property. Miriam is also a photographer and we had a great time nerding out about cameras together.